Have you ever watched the contestants on a TV game show engaged in a brain battle? 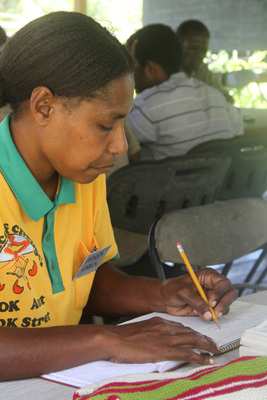 Recently men and women in two remote PNG villages in Oro Province held a similar contest, in their case in a duel to identify the best readers in the village. For weeks before the competition, readers practiced the chosen four chapters of Luke. They worked on correct pronunciation, smoothness, and intonation. A few minutes before the competition was to begin, they were given their assigned portion of about ten verses to read. When Jim and Joan Farr and representatives of the Baruga translation team arrived in the village, the people were ready. A crowd gathered to listen as each competitor read their assigned verses aloud. The translation team served as the judges, carefully noting uncorrected reading mistakes while simultaneously rating for smoothness and intonation. One lady who entered the contest was from a different language group and only had two years of formal schooling. She participated because she wanted to encourage others by her example. Another exemplary competitor was a teenage girl who is only in 4th grade but who was by far the best reader in her village. Although the Farrs were disappointed that no children chose to participate, they were happy about the enthusiasm of the adults for improving their literacy skills. Every participant received a homemade bookmark that was a gift from school-aged children in one of the Farr’s churches in America. Winners picked from various prizes, such as school supplies and cooking utensils. In addition, they acquired a lasting treasure, the ability to read aloud fluently. The next time a game show plays on your TV screen, think of the Baruga contestants and their diligence to master reading in a way that is expressive, natural, and easy for the hearers to understand. I once was in a commercial airline which was seconds from landing in a heavy crosswind. As I looked out my side window, much to my surprise, I saw the runway. That wasn’t a great feeling. The plane made a sharp turn and seconds later the wheels touched down … hard! Let’s just say, I like it when things line up early! In the world of language development and Bible translation, it doesn’t always work that way. Good plans are made but life is so unpredictable in Papua New Guinea. 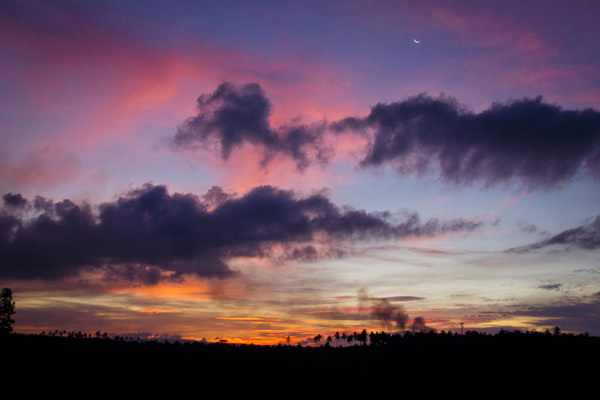 PNG’s motto is “The land of the unexpected” and it certainly lives up to that. Language work is often in flux because of transportation issues. People can arrive late or even not at all. 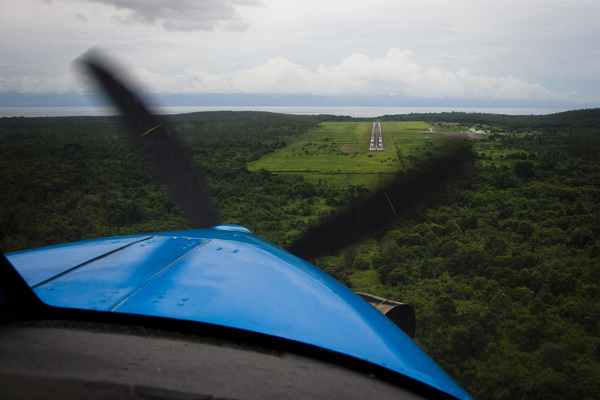 It’s unclear if a flight will go because an airstrip’s grass is uncut. An inaccurate weather report makes for unpredicted rough seas or a landslide blocks a road. But it’s not just travel that impacts good planning. A workshop gets cancelled because the teacher is sick. Typesetting of a New Testament is delayed because a key person has a death in the family. Work is left unfinished because of personality conflicts based on cultural differences or unmet expectations. Sometimes things just don’t line up. When landing an airplane, often the runway is in sight but the pilot still needs to make course corrections due to unforeseen circumstances. This is true in life as well. Pray to the Great Pilot for plans that are doable but are flexible enough to meet the unpredicted challenges. Building on yesterday’s theme, shades of culture, cultures have different flavours too… and for that, we all should be glad. Language is the spice that keeps cultures alive. Each language has a unique vocabulary. Sometimes what a culture deems important, is reflected by the many different words that are used for a certain object. For example , the word banana is, well, banana, right? 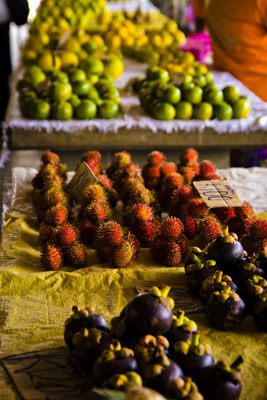 In some areas of Papua New Guinea, there may be as many as 30 different words to represent “banana”. Languages provide the vivid flavours that enhance our cultures. 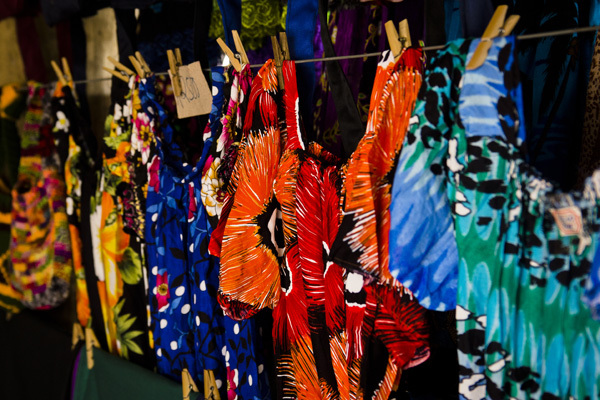 With over 800 languages, PNG provides the world with a real feast! 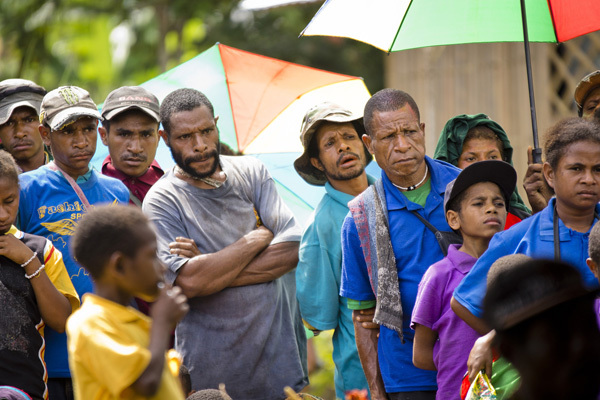 Pray for PNG to taste and see God’s word in all of their heart languages. Ever think about how many colours there are in life? Each primary colour (red, blue, yellow) contrasts significantly with the other primary colours. But then combining them, creates a brand new colour! Red & blue make purple while blue & yellow make green. Even combinations of similar colours create different shades of that colour, all of them unique and valuable when painting a picture. So it is with language and culture. Languages provide the unique “shades” that make a culture beautiful. Since that’s true, Papua New Guinea is a masterpiece with over 800 languages! Each language focuses their stories through the lens of their words. Pray for PNG as they continue to put their words on paper through the language development and Bible translation effort. Storytelling is a powerful method of sharing God’s truth, and Julie has seen this firsthand both in her home language of Maiwala, as well as serving as a trainer of Oral Bible Storytelling throughout the nation. She uses her gifts to teach people how to tell vivid, life-changing Biblical stories in their own languages, which often paves the way for written Bible translation. A lot of people take security measures to protect their home from intruders. 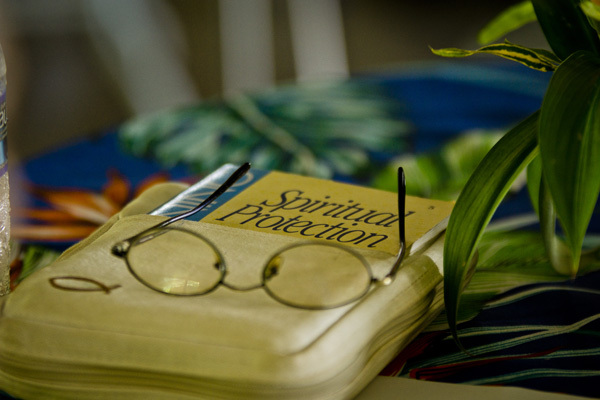 What about the things that intrude on your spiritual life? The Word of God provides a “Safe Haven” from life’s dangers. Living without this protection is like leaving the front door wide open. It really is our first line of defense. 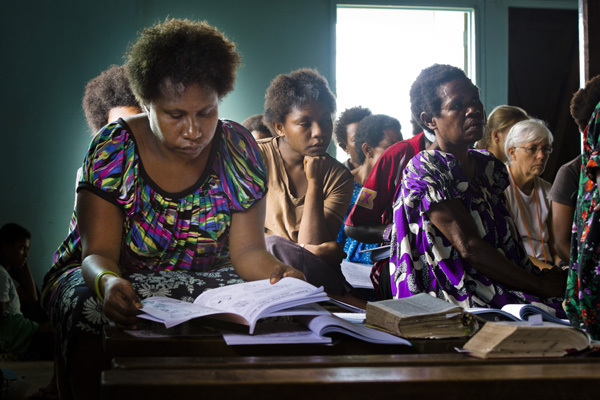 Almost a third of Papua New Guinea’s languages do not have the Scriptures in their heart language. Reading the Scriptures in a second language isn’t the same. Pray for front-line security for these groups. Legs braced and apron spattered, Simeon* slowly pulled the squeegee toward himself, spreading the ink evenly across the screen. Across from him, Nasin* carefully unclipped the screen printing frame and pulled out a sheet of paper covered in new writing—his writing. It was the first page of a storybook printed in Domung. Today, 23 April, 2014, people around the globe celebrate World Book Day. It was created by UNESCO as a way of “encouraging everyone…to discover the pleasure of reading and gain a renewed respect for the irreplaceable contributions of those, who have furthered the social and cultural progress of humanity.” – taken from http://www.un.org. Each year, a city is chosen as the “World Book Capital”; this year, Port Harcourt, Nigeria, will encourage the world by providing an example of a city determined to use literacy as a tool to reach its people. 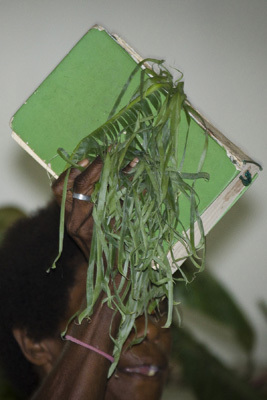 Without the work of literacy, translation, and language development, books and all the wisdom, joy, beauty, and knowledge contained therein remain silent for many languages of the world, including many people groups in Papua New Guinea. Nasin and Simeon worked all afternoon, painstakingly inking the silkscreen, squeezing off the excess, and laying page after page to rest on benches behind them, until the humidity of the Rai Coast in Madang province curled the edges, dry, ready to be bound. Only when the light started to fade did they finally stop, dropping to the benches in exhaustion. But Nasin paused, then reached for the book, gently peeling back the cover. It was time to read.